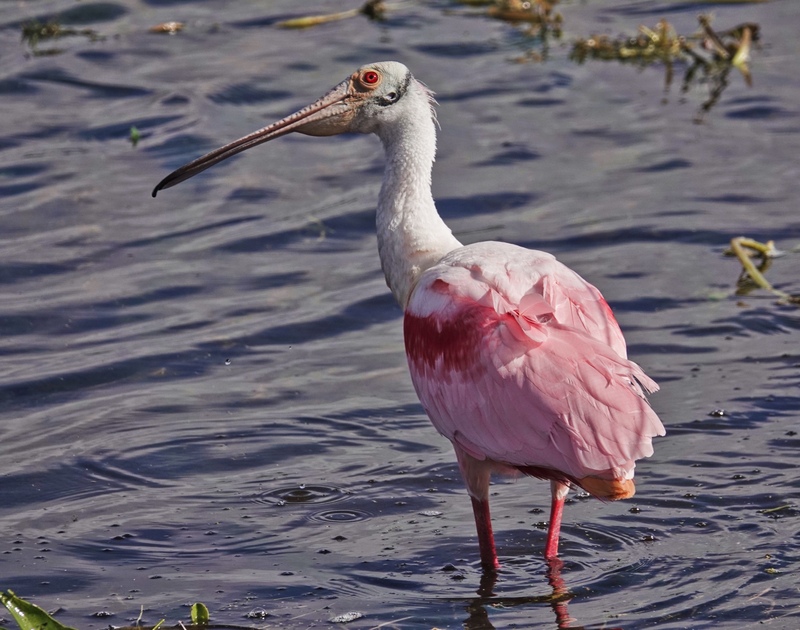 There is nothing quite like a Roseate Spoonbill in breeding plumage. The bright pink body and wing feathers, the green skin on the head, the white feathers on the neck, and the bright, bright red eye, here caught in full sun for the full effect. Orlando Wetlands Park, Christmas, Florida. Sony RX10iv at 600mm equivalent. Program mode with my custom birds and wildlife modifications. 1/1000th @ f5.6 @ ISO 100. -.3EV. Processed in Polarr. Not only portrait…but head and shoulders! 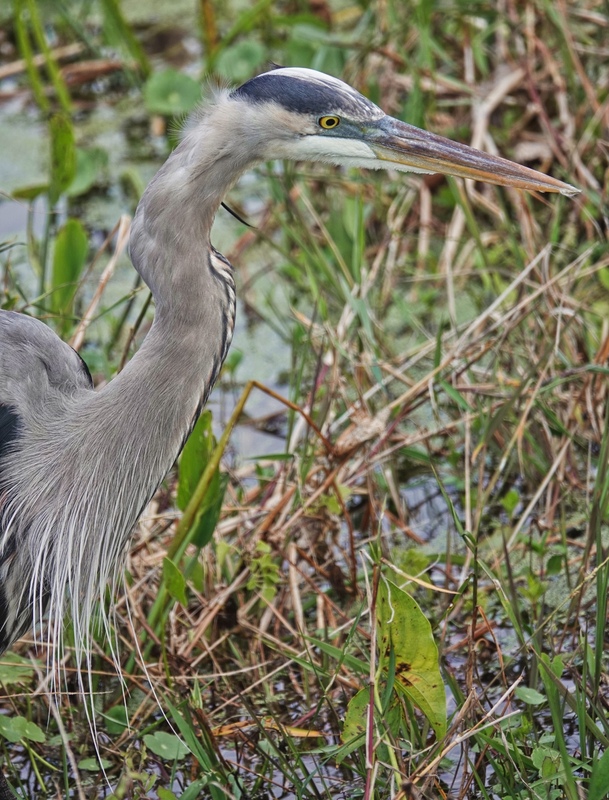 Another close shot of a heron from Orlando Wetlands Park in Christmas, Florida. 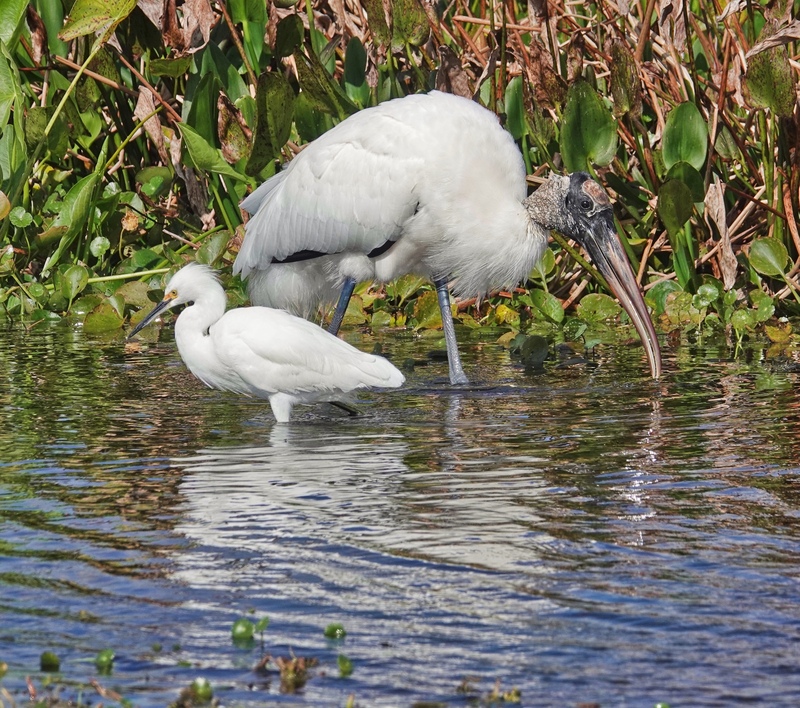 Walking the trails along the dikes at Orlando Wetlands can bring you very close to the wildlife. 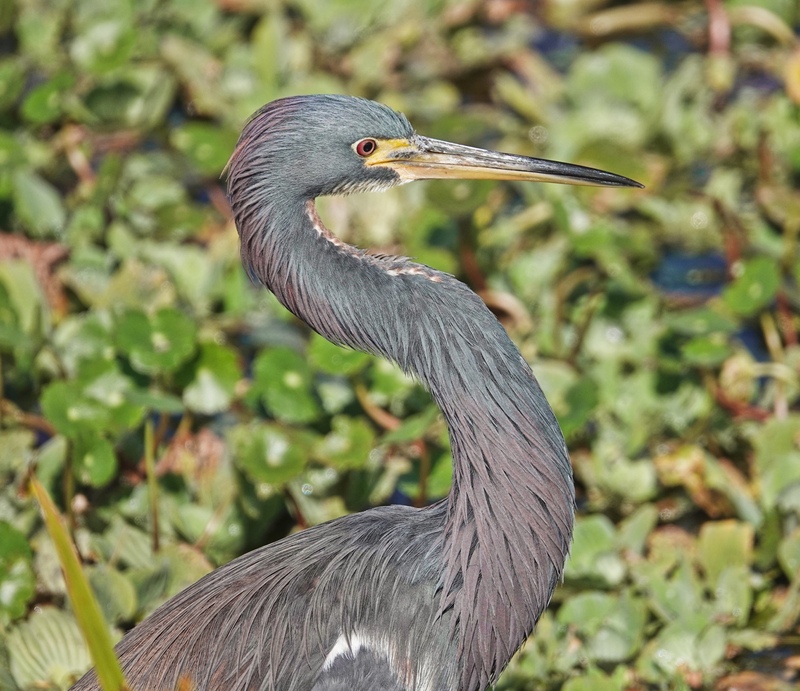 Once again, as in yesterday’s Tricolored Heron, the variety of texture in the fine feathers of the head and neck of the bird always fascinates me. If you can view the image large enough, check out the fine fluffy feathers behind the eye and to the back of the head. Sony RX10iv at 600mm equivalent. My birds and wildlife modifications of Program mode. 1/400th @ f4 @ ISO 100. -.3EV Processed in Polarr. This morning we are back to my pics from Florida and the Space Coast Birding Festival in January. This is another close encounter from Orlando Wetlands Park, this time with a Tricolored Heron. It was feeding right at the edge of the water right next to the dyke and the trail. This is only cropped on the horizontal dimension so it is basically a full frame shot at 600mm equivalent. It captures all the feather texture and subtitle shades of purple-grey of the bird…and the pose catches the energy of the hunter well…or that is what I think. 🙂 Sony RX10iv. My birds and wildlife modifications to Program mode. 1/1000th @ f4.5 @ ISO 100. -.3EV. Processed in Polarr. 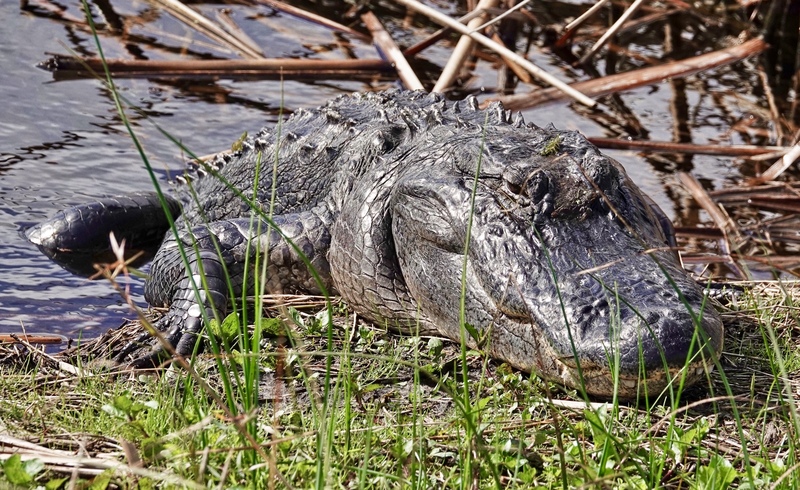 No trip to Orlando Wetlands Park in Christmas, Florida would be complete without an Alligator or two. They have some big ones there, and they are in the habit of hauling out at the water’s edge to warm up in the sun. On occasion they even get right up on the pathways. My rule is “never get closer to a gator than twice the length of its body” and don’t get close at all if you can help it. This shot was taken at 212mm equivalent from about 15 feet away…which was a little closer than I was completely comfortable with, but the alligators never even blinked as I edged by on the path above it. The worst part was that there was a Little Bittern in the reeds behind it, and I could not get a good shot of the bird without getting closer to the Alligator…such is life at Orlando Wetlands Park. Sony RX10iv at 212mm equivalent. My birds and wildlife modifications of Program mode. 1/800th @ f4 @ ISO 100. -.3EV. Processed in Polarr. I have written before about this pair of companionable Florida Sandhill Cranes that walked up the Limpkin trail with me at Orlando Wetlands Park in Christmas Florida. This shot was taken at 30mm equivalent, so I was just out of the frame behind the closest crane, and, as I said before, if I stopped to take a photo, they stopped and waited for me. It was so strange and so wonderful. And once more, I just can’t say enough about how great a place Orlando Wetlands Park is, in that it allows this kind of close encounter, on foot, with the bird and wildlife. Sony RX10iv at 30mm equivalent. My birds and wildlife modifications of Program mode. 1/1000th @ f4.5 @ ISO 100. -.3EV. Processed in Polarr. This is, admittedly, a somewhat odd photo. I was walking down Limpkin Way at Orlando Wetlands Park, perpendicular to the birding trail and there was this Great Blue Heron standing on the dyke ahead of me. I took a few shots and walked closer. And it just stood there. So I took a few more shots, and walked, and it stood. I was close enough so that I had to zoom back to fit the bird in the frame, and then I went for a head shot at full telephoto. Of course just then it jumped into flight and all I got was its head and a piece of a wing in the frame. The crop is what seemed most effective. Sony RX10iv at 600mm equivalent. My birds and wildlife modifications of Program mode. 1/1000th @ f5 @ ISO 100. -.3EV. Processed in Polarr. 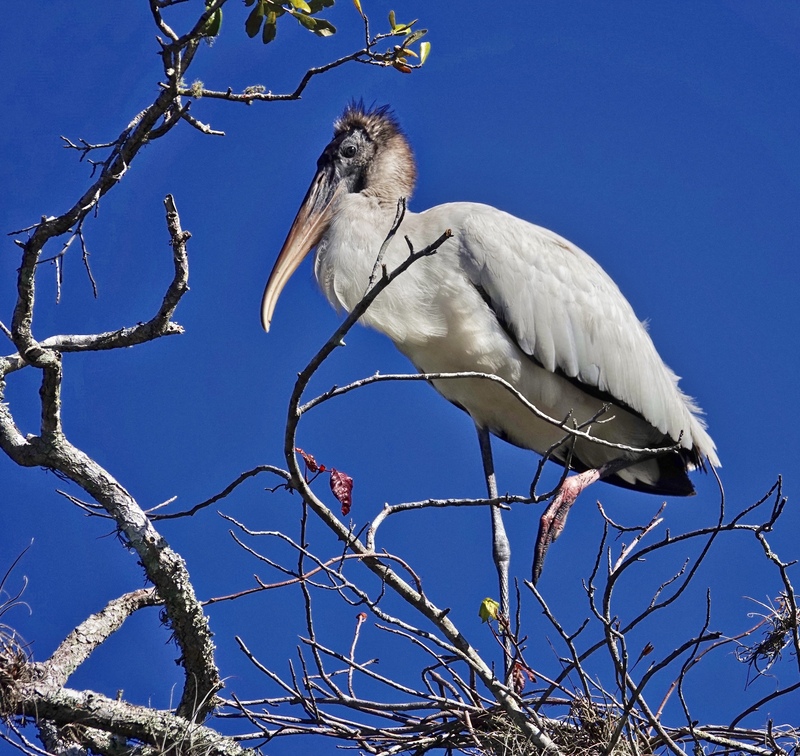 Yesterday I posted a Wood Stork feeding from Orlando Wetlands Park, but the first Wood Stork of my last Florida trip was actually standing tall in a tree beside the road at Merritt Island National Wildlife Refuge, near the Visitor Center. I pulled off in the chigger grass and walked back to get the shot. This is a juvenile, as you can tell by the feathers on the back of the neck and crown. Sony RX10iv at 535mm equivalent. My birds and wildlife modifications of Program mode. 1/1000th @ f6.3 @ ISO 100. -1EV. Processed in Polarr. 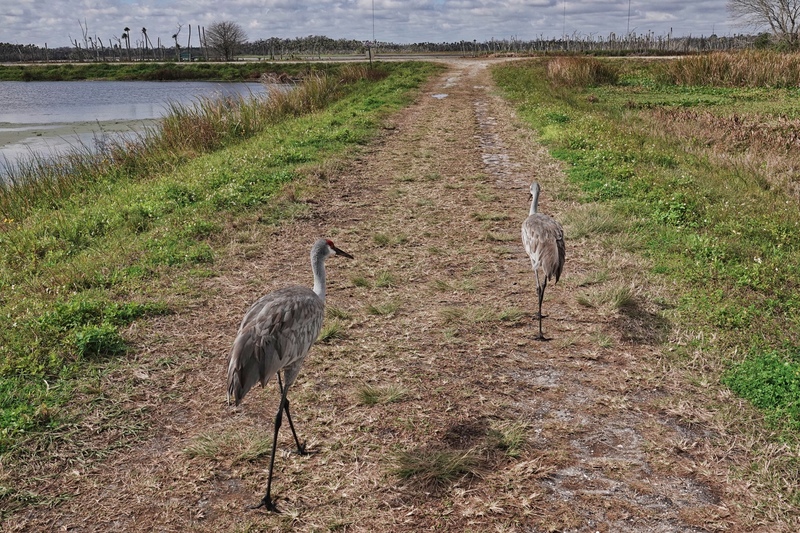 There is a difference between walking the dykes at Orlando Wetlands Park in Christmas Florida and driving the dykes at Blackpoint Wildlife Drive at Merritt Island, or even the dykes at Viera Wetlands in Viera. You might not actually be any closer to the birds, but its is definitely a more intimate experience. I came up on this odd couple feeding together as I was walking back down Bobcat Alley toward the main birding trail at Orlando Wetlands. They were working a patch of water plants just out from the shoreline in the angle between the two trails…close enough so they made a nice composition in a 600mm frame. Sony RX10iv at 600mm equivalent. My birds and wildlife modifications of Program mode. 1/1000th @ f5.6 @ ISO 100. -.3EV. Processed in Polarr. 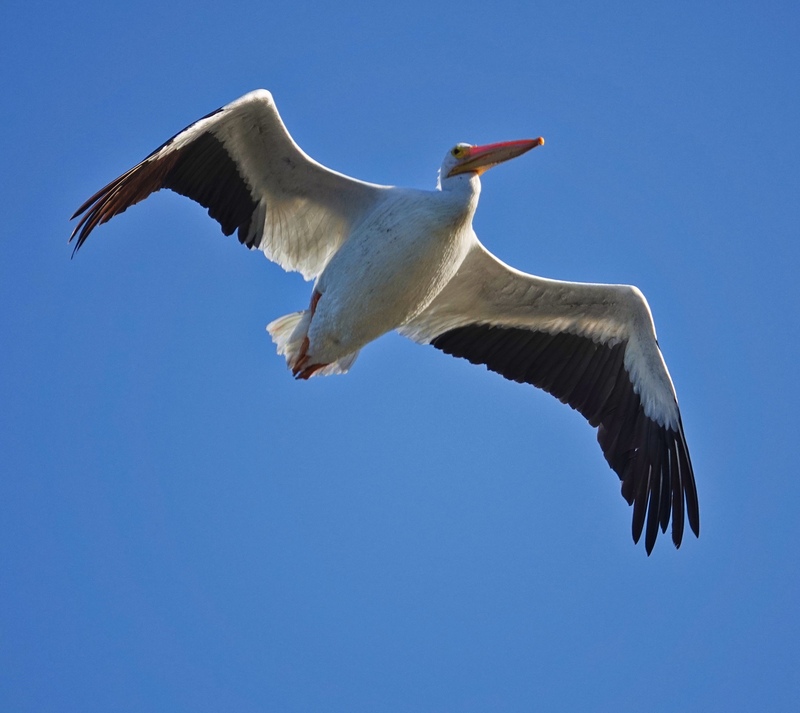 One morning on Black Point Drive at Merritt Island National Wildlife Refuge in Titusville, Florida, a small group of White Pelicans flew pretty much directly overhead. I was able to catch a few as they passed over. It was a good opportunity since the light reflected from the ponds illuminated the underside of the wings, which otherwise would have been in heavy silhouette. Sony RX10iv at 600mm equivalent. My birds in flight and action modifications to Program mode. 1/1000th @ f4 @ ISO 100. +1EV exposure compensation (to help with the wings). Processed in Polarr. 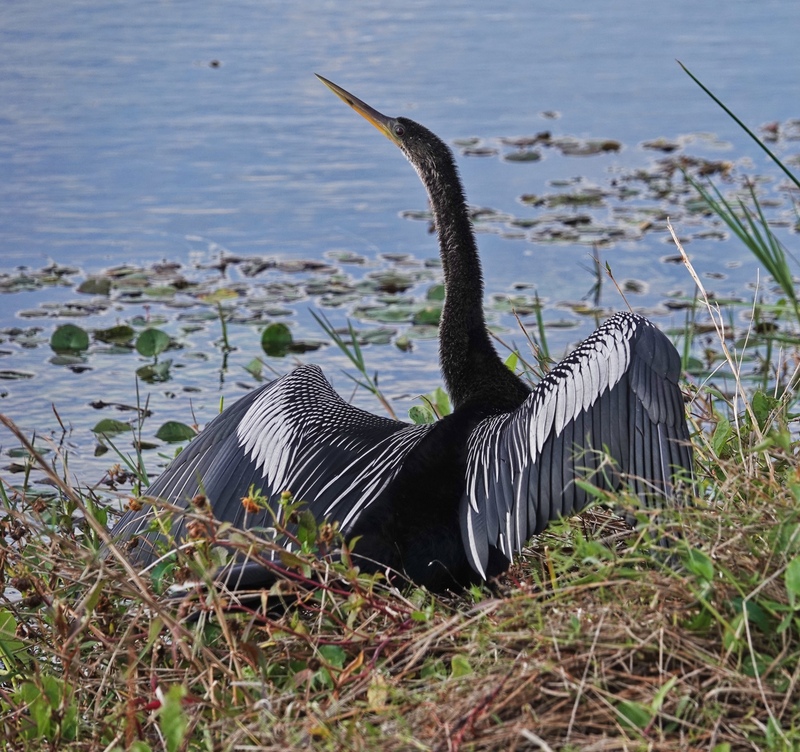 At Orlando Wetlands Park in Christmas, Florida, the Anhingas have taken to drying their wings on the ground. Other places I see them generally in trees or on old palm trunks, or tucked into the mangroves at least…but at the Orlando Wetlands they just haul out at the edge of the pond and spread themselves to dry. And they are not particularly disturbed by humans. I walked right by several and they did no more than crane their necks at me. They were not in full breeding plumage yet when I visited, but coming on toward it. This bird shows the full wing pattern of black and white. Sony RX10iv at 327mm equivalent (so I was really close). My birds and wildlife modifications to Program mode. 1/640th @ f4 @ ISO 100. Processed in Polarr.